Don't have a lot of spare cash to fund your classroom needs? Feeling like your desk is already a mess after just a few weeks in? Struggling to get a good organizational system in place? You are not alone! 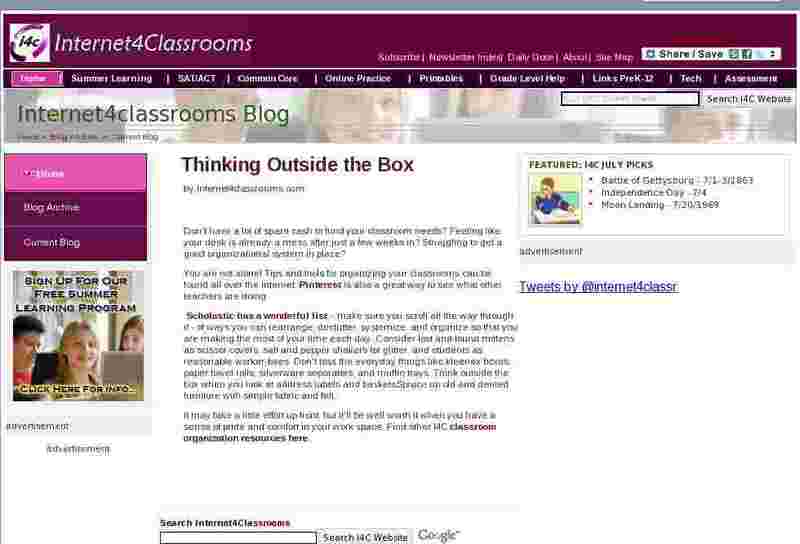 Tips and tools for organizing your classrooms can be found all over the internet. Pinterest is also a great way to see what other teachers are doing. Scholastic has a wonderful list - make sure you scroll all the way through it - of ways you can rearrange, declutter, systemize, and organize so that you are making the most of your time each day. Consider lost and found mittens as scissor covers, salt and pepper shakers for glitter, and students as reasonable worker-bees. Don't toss the everyday things like kleenex boxes, paper towel rolls, silverware separators, and muffin trays. Think outside the box when you look at address labels and baskets. Spruce up old and dented furniture with simple fabric and felt. It may take a little effort up front, but it'll be well worth it when you have a sense of pride and comfort in your work space. Find other I4C classroom organization resources here.